Are oysters a powerful aphrosiac, or just damn delicious? Let’s find out with a trip to Sydney’s new and much-needed oyster bar, the Morrison Bar and Oyster Room! The Morrison, just opened in Sydney at the site of the old Brooklyn Hotel with a bevy of former head chefs in the kitchen, is marketed as a tribute to the great oyster bars of New York and London. But anyone with eyes to see will also note that it is also a subtle tribute to Jim Morrison and The Doors: there aren’t great Mao posters of the man at every turn like there are of Bruce Lee at Grasshopper, but the signs are everywhere. There are doors – the doors – all over, not just to get in to the place, but also to move between the dining room and the cocktail bar, down half a flight of stairs. Morrison wrote some of his best stuff on acid, and the cups of delightfully sharp mignonette that accompany the oysters are a tribute to the power of acidity to concentrate the mind. 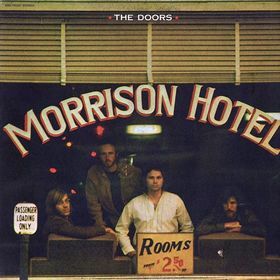 Upstairs in the gents, men quietly face the wall and take out their oldfella in silent tribute to the sultry 1969 night Morrison was arrested for indecent exposure. Or maybe they’re just having a piss. The Finkelstein Review better not shut down this tabloid! In any case, the Morrison is not a place that takes itself too seriously. It’s a big space, but still crowded as hell on a Friday night with a great energy. It’s a good thing we booked, the urgent need for a date night having made itself felt after a week’s skiing with the children. The maître d’ who seats us looks up our reservation and hands us over to another staffer, telling her, “Table 69”, then to me, sotto voce with a wink and a smirk: “Great table…”. As one who spends his working weeks waiting for HR to tap him on the shoulder for just this sort of sidelong inappropriateness, the Prick appreciates a baudy brasserie. So, seated, it’s cocktails and menus time: An espresso martini (or “yuppie speedball”, as we call them) for Mrs Prick, while I try the signature Morrison cocktail (really just apple juice and vodka, refreshing but nothing special). The menu comes in two parts. 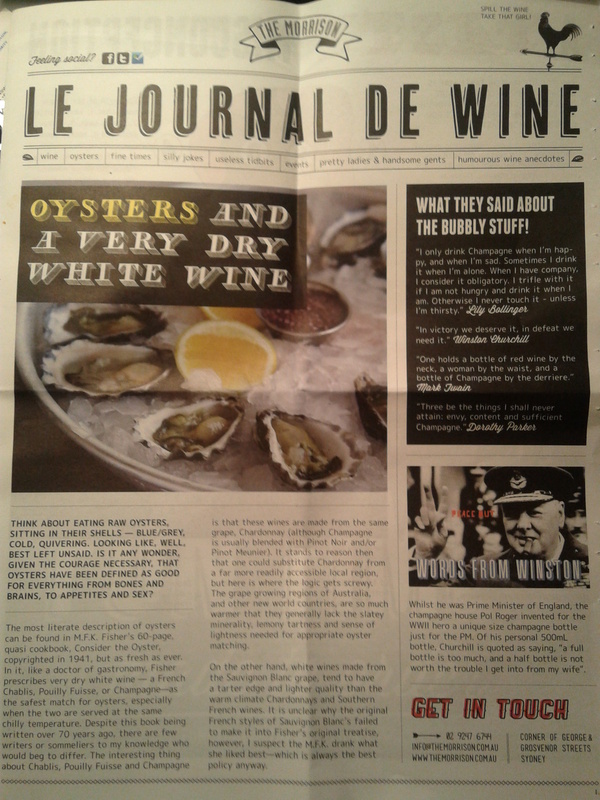 An elegant food menu is supplemented by the tabloid “Le Journal de Wine”, which is one part wine list, one part oyster menu, and one part editorial: boozy quips and aphorisms from Churchill, Dorothy Parker, and Lilly Bollinger; short articles about wine and travel. Again, they’re serious about their food, but they don’t take themselves too seriously. We start the feast with a mixed dozen oysters, which quickly becomes two dozen, all washed down with a Joseph Cattin Pinot Blanc from Alsace. Perhaps a bit more residual sugar than necessary for the task, but I love the varietal. Here I should note that the Morrison’s team is not only clever and engaged but really knows their stuff. Our guy, and indeed everyone we encounter, is that rare breed in Sydney dining, namely, a professional, talking us through the options but never talking down. 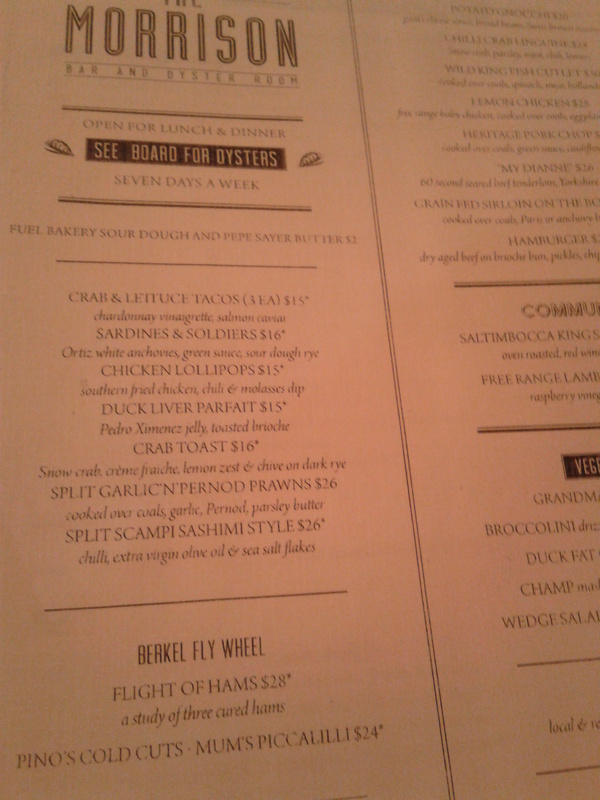 Not since the old Bayswater closed down in Kings Cross have I seen such a good selection of freshly-shucked oysters. When they’re available, the Morrison even serves those rare beasts, the native Angassi. The winners of the night are from Tuross Lake, plump and steely, though the James Magnussens of the night would have to be the Lake Wapengo rock oysters, which lost gold in our books by only a fraction but were rich, creamy and herbaceous in a way I’d never before known a straight, raw oyster to be. 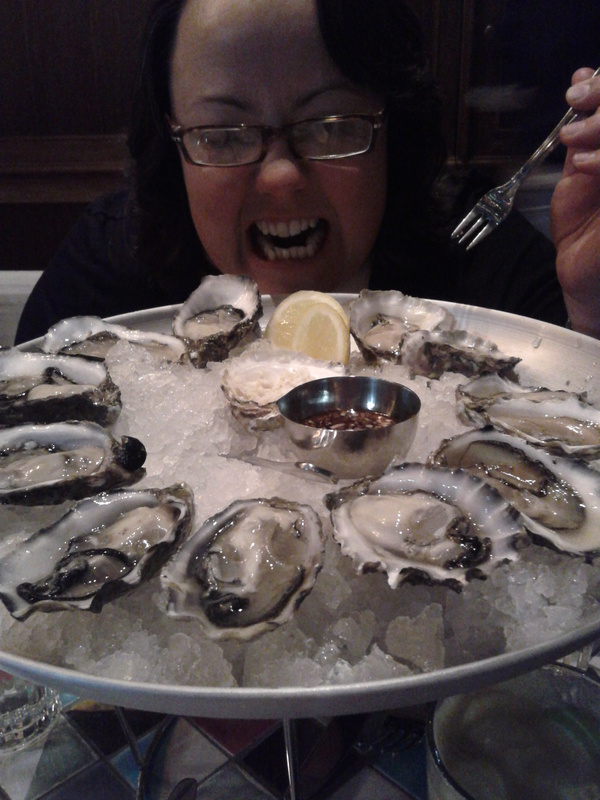 Mrs Prick loves her oysters! The Morrison takes a bit of a risk in offering a full menu along with their slate of oysters (which changes daily, about a half-dozen varieties at any given time): by the time the big dishes come, many diners will have already had what they consider to be the main event, and those bivalves are a tough act to follow. This kitchen pulls it off, though: we build a little degustation of crab “tacos” (very more-ish, if a bit salty, these would be great at a cocktail party) and deep-fried chicken “lollipops”, though there were a number of other nibbly plates I’d like to get stuck into next time. We finish off by sharing the 350g sirloin on the bone, a great cut only enhanced by its being cooked over a charcoal fire, and some thrice-cut duck fat chips, and though the place is hopping no one is pushing us to finish as we linger over the last glasses of a savoury but austere shiraz-viognier from Bendigo. I’m told, though I don’t recall seeing it on the menu, that they also offer a 1kg t-bone for sharing, and that is surely a must-have dish for our return. In the meantime, the Morrison is a great addition to the city’s dining scene, and along with dinner I could see it doing a strong lunch trade among those who still have the sorts of jobs where one can afford to camp out a table at 1pm and stay for closing. The Pricks will be back for sure. Oh, and as for the opening question? Visit the Morrison and find out for yourself! How much were the oysters? I’ve always wanted to repeat the attempt that Tractorhead and I made to scoff 100 each in a single sitting (we choked in the 90s). Would that be a budget breaker? 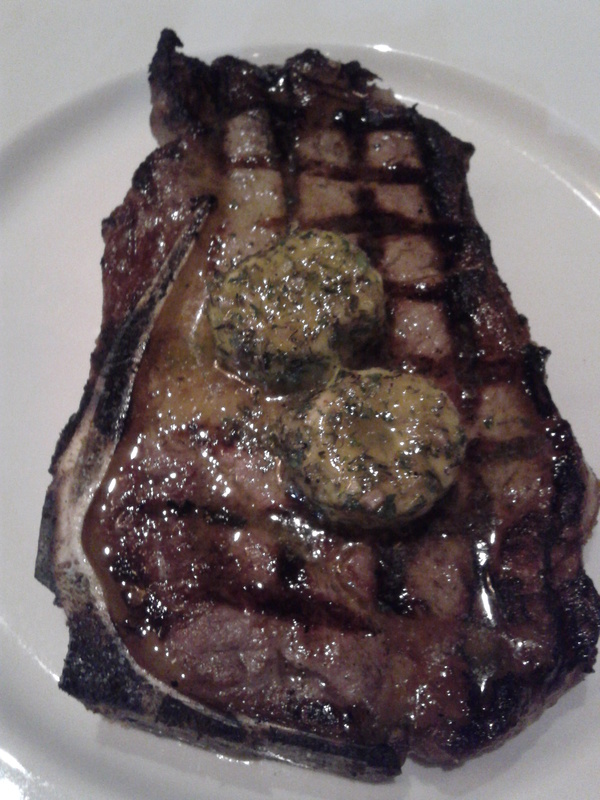 As for the 1kg steak – might have to take Junior there for dinner. That would just about do him on his own. As you’ll discover as the little pricks get older, it’s quite incredible what a growing teenager can put away. oysters are $3.80 for rock and pacific and $5.50 for the angassi when i visited. Sorry guys but you should come to Eden where we buy the best large oysters shucked for $12 per dozen and they are fresh out of the water. Our local butcher will cut you any size bit of cow you want and you can BBQ on your back deck with a million dollar view of Twofold bay. No parking worries and no waiting. You can even crank up Morrison Hotel on your iPod to complete the effect. My own back deck isn’t in Eden. It’s not even near Wollongong. I stopped in Eden for a couple of hours on the way to Melbourne from Sydney for Christmas, Dec 2001. Loved the oysters, cheeses but missed out on the steak. Would love to spend a w/end there. That sounds like my kind of place. The kitchen brigade certainly has an interesting track record. I used to work in Bridge St in the 90’s and the old Brooklyn hotel did not have such delights (although it did have a proper, but not very good, parmigiana.). I’ll have to go for lunch or dinner next time I’m in Sydney. I’m eating low carb, so a dozen oysters and one of those big t-bones with a salad would fit the bill. Hopefully it is much better than Bob’s steak and Chop House in Melbourne where I had dinner last week. The steak (600 g T-Bone) was just fine, but the place is the first local version of an American chain, and it showed in the details. They did have an excellent list of rums, though, including the fabulous Ron Zacapa centenario XO, which you don’t see on restaurant lists very often. Rum! Now there’s a word to warm my heart. When I was circa 27yo I made the heartbreaking discovery that in some parts of this otherwise great land, rum is not the main tipple. On the spot I resolved to visit, yes, but NEVER to live in any part of the country that was so emasculated that “I’ll have a drink” did not mean the same as “I’ll have a rum”. Er… Dr. Duck, I wasn’t talking about cordial drinkers. I meant macho stuff: Rum + hot water, (or perhaps cool water) or even with milk! etc. etc. I’ll agree that the pommy turps (bundaberg) is so bad that mixing it with coke can only improve it! My apologies, Steve. No aspersions meant in your direction. It remains true, though that for many rum drinkers Bundy and coke is all there is. On the topic of cordial drinkers, my grandfather was a publican, and a favorite drink in the 1930’s at his first pub in the New England area was a Mungindi shandy …. apparently a tot of rum with a dash of neat raspberry cordial. I have no desire to see what it tastes like. That, Dr. Duck, is one of the oldest drinks in this great nation. Known as “barmaid’s blush” it was an equal measure of rum & raspberry! It has been mentioned in tales written by people who lived in Old Sydney Town, when that great settlement (or dive, depending upon one’s perspective) was the only settlement on this continent. I’ve had the heart warming experience of entering bush pubs, asking for a “barmaid’s blush” & being served exactly that! I suppose it has many names, depending upon which shanty one is in. The only mention I’ve found in contemporary culture has been a line in a country ballad (Ted Egan, IIRC) where it is called by the very self-explanatory name of: “rum & raspberry”. Just then a townle bloke, hatless, wearln’ a black sports shirt with sleeves chopped on at the elbow, sportln’ a wristlet watch, an’ wearln’ a pair of grey flannel strides with hips big enough for a publican’s wife, taperin’ in under the knees, swellin’ out like a balloon an’ just showin’ the tips of his shoes, oowls over to me an’ says. ‘Have a drink, Bushie.’ Ex cusin’ meself for not refusin’, I calls for a double rum an’ sinks it neat, while the toff is drinkln’ a ladles’ waist of barmaid’s blush. Knowln’ In me heart it’s ‘Have another,’ and not ‘Come an’ have a drink,’ that keeps me on me hocks in the ashes, I says, ‘Give it a name.’ He has his beer and raspberry again to make bis breath smell pretty, an’ I sticks to me giggle soup. Bill Bowyang was the pen name of journalist Alexander Vindex Vennard (1884-1947), who had an interesting life.